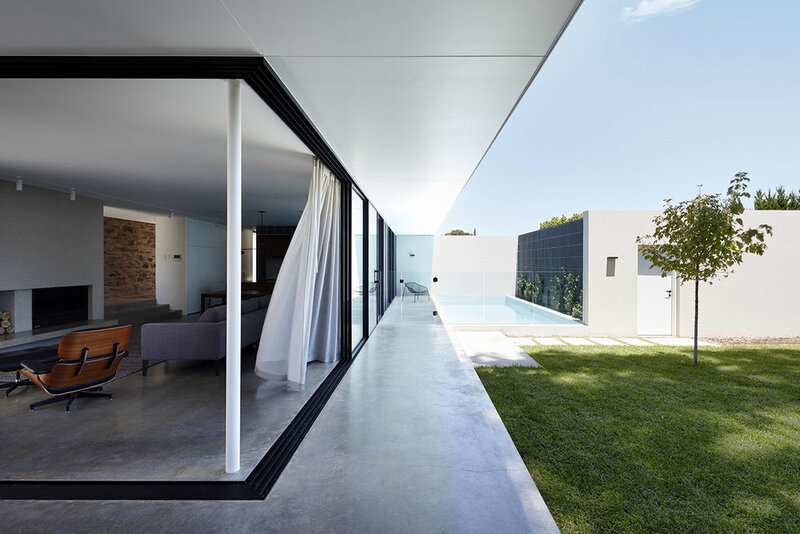 MH House consists of a pavilion-style addition and the refurbishment of a dilapidated Victorian bluestone villa. The addition provides a new light-filled kitchen and family living space that is open-plan, yet intimate in scale, with a strong connection to the outdoors. Materials are textured but uncomplicated, limited in number with refined detailing of junctions to distinguish the pavilion as a separate entity while respecting the heritage and scale of the villa. Floor to ceiling glass and minimal profile sliding doors accentuates the pavilion's strong horizontal lines. The lounge can be opened almost entirely to the external area and the continuity of finishes reinforces this integration of indoor and outdoor living spaces. A compact joinery ‘pod’ clad in American walnut timber contains the kitchen, pantry and laundry and conceals many services. It is centrally located, allowing natural light to penetrate the ‘working’ interior zone from both sides and and provide uninterrupted views to the pool and garden.